Hello Basketball World! I had another busy week with school, basketball, soccer and working out. On Monday after school I had a great workout with Coach Derrick Mims and Chris Muniz. As always, there was a lot of conditioning and skill work. We focused on the pick ‘n roll and how to attack it. On Tuesday morning I got up at 6 a.m. to go to my favorite trainer, Obe Roundtree. I worked out for an hour before school. Working out with Obe is never boring. Each workout is different and seems to be harder than the last. Right after school, I went to the soccer field with some of my team mates for the all-star game. I played goalie (my regular position) for the first half, but during the second half Coach Gillespie let me play offense for the first time in my life. Without having a clue about playing offense in the field, I surprised myself and everyone else by scoring two goals! It was a great feeling. After the game, my coach told me and my mom that if he knew how I could play in the field, he would have put me there more often. Playing soccer was a lot of fun and thank you, Coach Gillespie for being a great coach. Tuesday night I was invited to an open gym at Central Catholic High School in Allentown. I got a good run. Thank you, Coach Dennis Csencsits, for inviting me. Wednesday, after school, my dad took me to DeSales University for some shooting. We got up a ton of shots. I like how I’m shooting the ball right now. 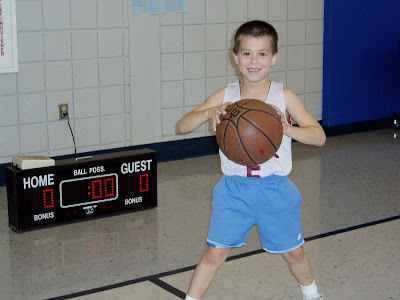 On Thursday, I went home from school and did some ball handling drills, but I couldn’t go to a gym for a full workout because I had a lot of homework and two big tests the next day. Friday, I had another workout before school with Obe and it was one of the hardest strength workouts I’ve ever had. For 45 minutes we did ropes, weights, and kettle bell exercises without any breaks. After school, my dad took me to Life Center Academy for a Team Final workout. We did a lot of ball handling and we worked on moving without the ball. On Saturday, I had a game in the SCBL league and made five three-pointers in the first half. I ended up scoring 31 points. After the game, I went to Dorney Park with my good friend, Justin Merraro. We had a great time and stayed until 11 p.m. Next weekend, I’m heading to Atlantic City for the Micah Lancaster Super Skillcase. I am looking forward to learning new drills and competing against some of the top players in the country.